It seems like Motorola is on a spree to refresh its handsets with the latest Android-based updates. After Moto G4 and Moto G4 Plus, the Moto Z is the next to receive a few latest updates. Motorola was one of the first few mobile makers to roll out the Android 7.0 for all its flagship devices when the Moto Z Nougat update was released last month. This move by Motorola was appreciated since even a huge company like Samsung is still yet to release a stable Nougat update for its Galaxy S7 device. Now, a new OTA update has been released based on the Android 7.0 Nougat for the Motorola Moto Z sets. The previous Nougat update that was released first in India and Canada, had arrived from Motorola for the Moto Z handsets and carried a build version of NPL25.86-15, whereas the latest update, with build no. NPL25.86-17-3 is an update only for those devices which are currently running the aforementioned Nougat build. According to a few reports, the latest update which is arriving as build version NPL25.86-17-3 has a file size of 540 MB. It will be an over-the-air (OTA) roll-out for the update. 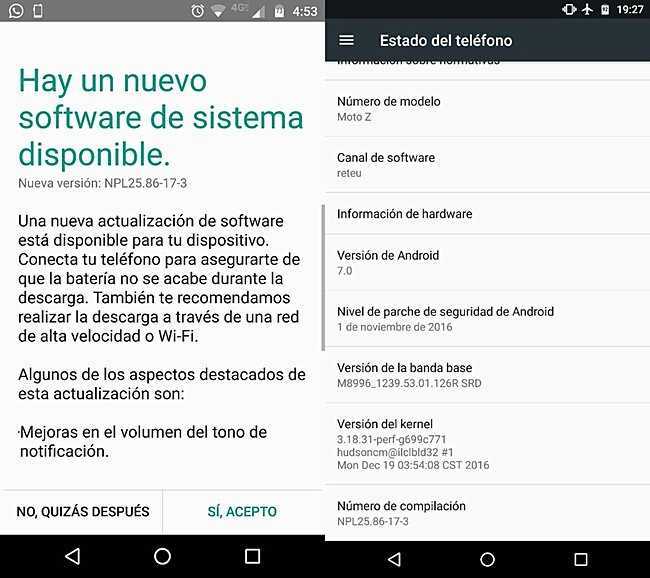 It is important to note that the new update has not bumped the Android OS version, which still remains at Android 7.0 Nougat and it is not an Android 7.1.1 build. The confusion could arise since even the Android 7.1.1 build is in the making its rounds to Motorola. The new update is out primarily to fix the low notification sound issue which was been experienced by many users on the Android 7.0 build, for quite some time now. Since the update has just started to roll out, it might probably take some time before the update notification pops up in the device. The users can manually check if their mobile device is eligible for the update by heading to the Settings menu of the device and looking out for it in the System updates section. According to sources, the second Nougat OTA update carrying the build version NPL25.86-17-3 for the Motorola Moto Z handsets is now available for download. A guide could help the users to check out the ADB sideload method for installing the latest update.